Hadron is a flat, responsive phpBB style with rich animations. 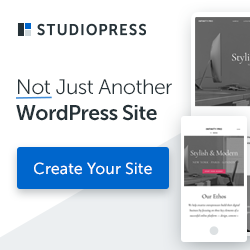 This style comes with 8 preset styles to choose and includes many useful features such as support for google fonts, imageset editor, 13 module areas, mobile menu, RTL support and much more. 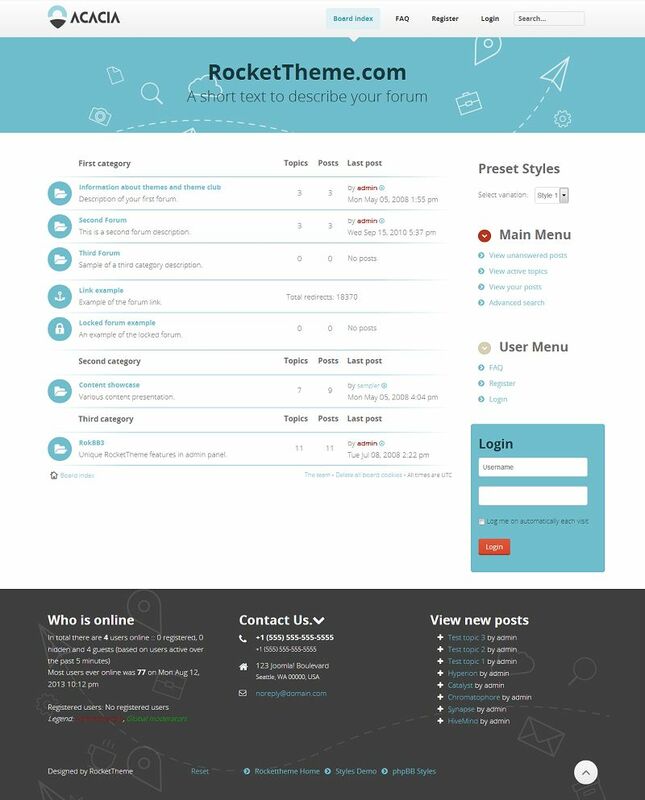 Developed using the feature rich ROKBB framework this theme is sure to provide a great forum experience. Paradigm is an elegant phpBB3 style from RocketTheme club. 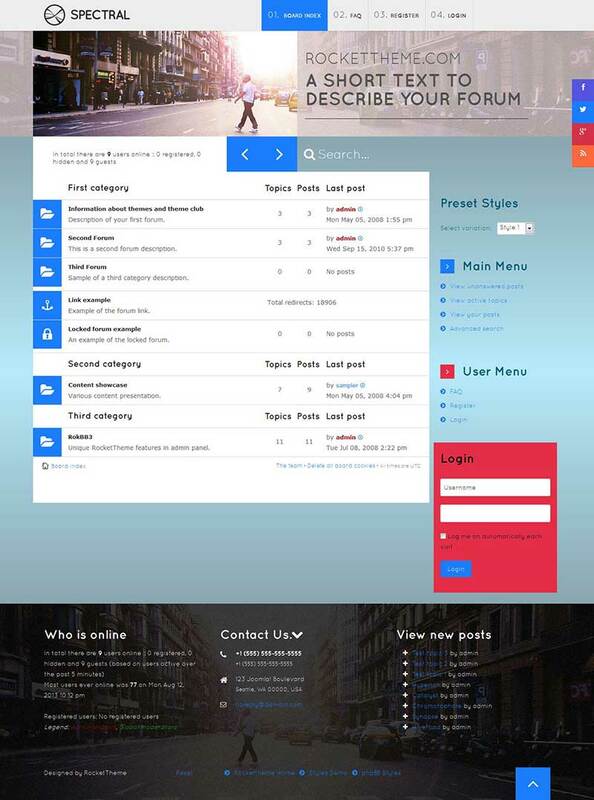 This theme has been designed using the powerful RokBB framework that provides the basis for advanced and extensive administrative control over the styles. It has a dynamically changing, transparent to opaque, fixed header, and supports WebFonts based scalable vector icons. Paradigm theme introduces Imageset Editor for previously implemented WebFonts based scalable vector topic icons. All icons are based on Font Awesome. 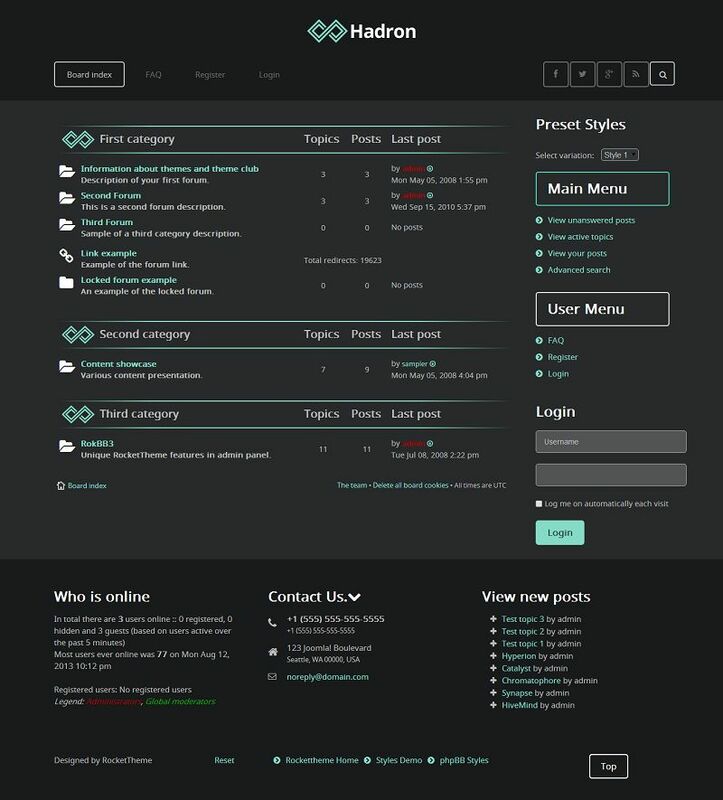 Spectral is the December 2013 phpBB3 style release from RocketTheme phpBB club. Based on RokBB 5 Framework, the style design of this template has been inspired by recent visual trends, blending subtle backgrounds and overlays, with text set by custom fonts. It has a responsive design that adapts to various devices according to the screen width. This template supports RokBridge to easily integrate with Joomla and WebFonts based scalable vector icons. 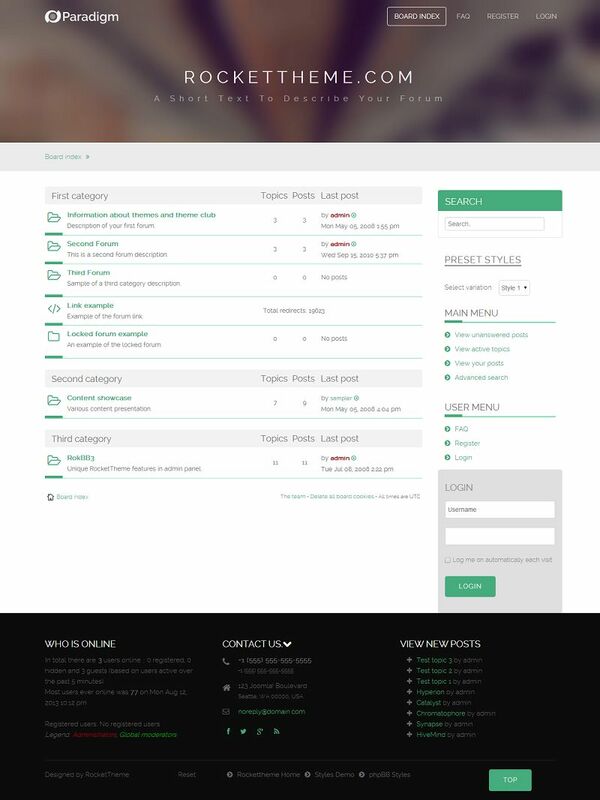 Acacia is a responsive phpBB3 style from RocketTheme. It has been designed using the advanced RokBB Framework which comes with many features such as an advanced administrator, integrated Tabs and Headlines styling and a different layout settings. This style includes many configurable features, to maximize the versatility and engagement of your forum. Acacia’s responsive grid system is designed for desktop, tablet and smartphone systems, each with minor modifications to ensure compatibility in each mode. Corvus is content centric phpBB3 style, built with rich media and text blocks. This style spruces up your forum with easily configurable items. Integrated styling is provided for extensions in its various layout types, such as Tabs and Headlines. The style is based on the RokBB Framework and comes with a lot of useful features and functions. 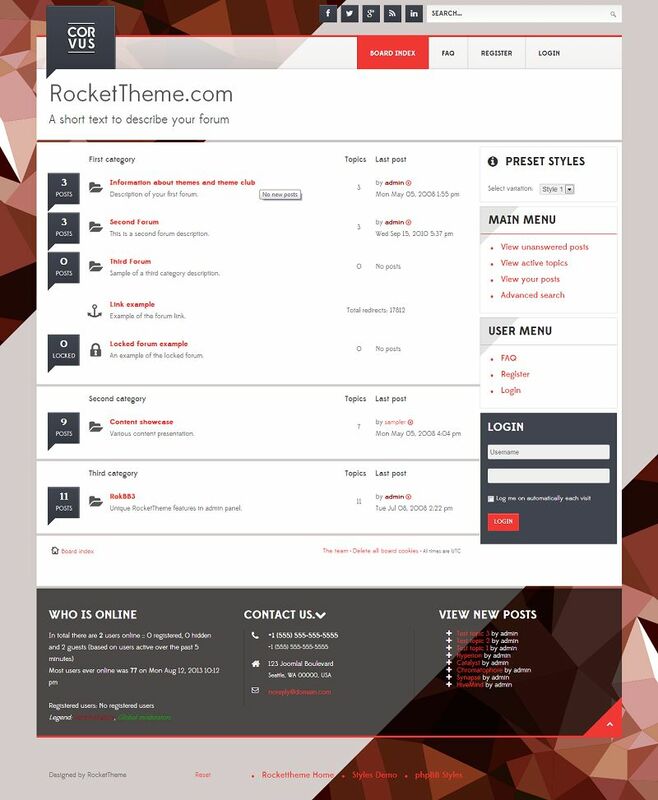 Join the RocketTheme phpBB Styles Club to download this style. Note: All the templates and extensions listed in this site are from their respective developers and all support requests should be sent directly to the developers. We do not provide support for any of the templates or extensions listed in this site. We just make some revenue if you purchase any of the product through the link from our site. We are dedicated to provide best collection of feature rich ready made website designs and extensions for various content management systems and ecommerce solutions. We do our best to keep the site fresh and updated with the latest designs. Around 8000 designs have been added to our collection so far. Keep watching for more updates. 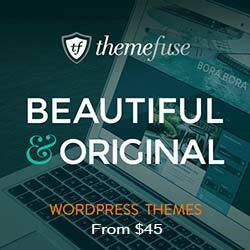 And, please do support us by purchasing your favorite templates and plugins through our website.